Breathe. You’d be surprised at how many of us hold our breaths or take small sips of air, especially in times of stress. So, if and when you notice yourself tensing up, slow down and take just three deep breaths. Notice how much calmer you feel when you remember to breathe. Read more about breathing here. Smile. You may be on a deadline trying to get the shopping done but please don’t be a Grinch. A smile can go a long way. If you get cut off in line, if someone grabs the last toy you were about to reach for, or if someone takes your parking spot, just smile and let it go. Watch how that smile changes yourself and others. Shake it out. Sometimes, the tension builds up so much that you just can’t take it anymore. In this case, it’s best to have some healthy outlets in place so that you don’t end up taking it out on others or harming yourself. 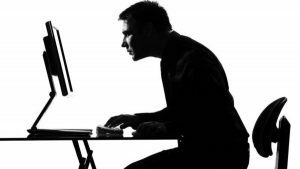 Exercise, laughter, talking with someone, dancing, drawing, and doing a hobby are all great ways to relieve stress but if you don’t have access to those things at the moment, you can always shake it out (preferable in the bathroom or behind your desk so no one sees you). And when I say “shake it out,” I mean let your whole body loose and SHAKE IT OUT! Now, doesn’t that feel good? Be present. Through it all, be present and in the moment. Be the eye of the storm and notice the energy around you. Enjoy the time with family and friends or the peace and quiet if you are alone. Savor the flavors of the delicious meal that you or someone else has prepared. Soak it all in for this moment is all we have and soon this too shall pass. May you survive and THRIVE today and every day. See you in the New Year! I took a road trip from LA to Boston in 2008 and my dad accompanied me on the first half of it. One of the stops along the way was Havasupai, which is just outside of the Grand Canyon. It is a hot, exposed 8 mile hike just to get down the canyon to the village where we stayed a couple of nights. On a day hike from there, we visited a series of falls. 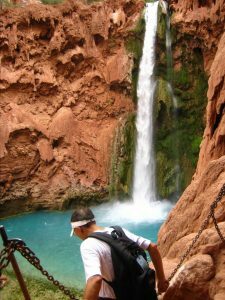 To get to the bottom of the second falls (Mooney Falls), the trail took us down a steep cliff with chains and ladders. My dad told me later that he was scared and wouldn’t have gone down but a guy about the same age as him came along and said, “Come on. Let’s go.” And so he went. I was so proud of him that day and will always remember the smile that came over his face when he overcame his fear and conquered the challenge. 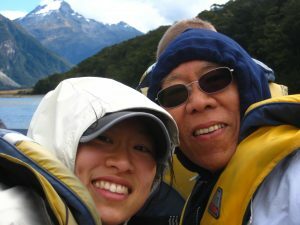 Another time, when my dad came to visit me in New Zealand, I brought him to explore one of the National Parks on the South Island. 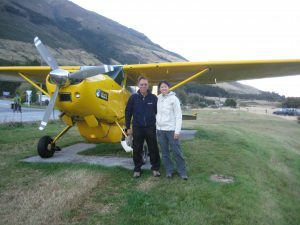 We took a small plane that landed us in a secluded valley. To get to the hut where we’d be staying overnight, we had to cross a river about 20 feet wide, filled with glacial water and not entirely calm. After pondering how we’d tackle the obstacle in front of us, we proceeded to take our shoes and socks off to brave the water that came up to our knees. We had a great evening at the hut all to ourselves and the next day, we hiked out of the valley in the rain where a jet boat picked us up. There are many more adventures I’ve shared with my dad and on all them, he never complained once, and that is what impressed me most. He didn’t complain about staying in huts with no running water or electricity; or about the thick mud pits on the tracks that we had to maneuver around; or about the precarious weather; or the length of the hikes. Life is full of experiences like these. No matter what they are, we can either resist with fear, worry, doubt, or anger; or respond with curiosity, humility, confidence, and love. So long as we choose the latter, we will be empowered and be able to go through life and death with peace in our hearts. I thank my father for not only giving me memories I will never forget but also for showing me how to find peace in my heart where I’ll hold him forever. It’s Spring! The snow is melting and the rain is washing away the old soil to make room for growth. 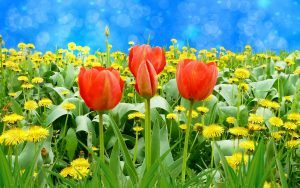 As the days get longer and the sun shines brighter, buds begin to appear and flowers blossom, bringing back color and vibrancy. Let us follow Nature’s path by getting rid of things that no longer serve us to make space for new opportunity. As time passes, we collect things. There’s no point in denying it; this is just what happens. We hold on to things for years, often forgetting why or how we got them in the first place. This applies to not just material things but emotions and relationships as well. Sometimes, these things hinder our growth, filling our homes and hearts with clutter so that there isn’t any chance of progress. But as Nature happens, forests burn in order to create room for new flora. Yes, there is a sense of loss at the time of fire. It’s always hard to let go of something we’ve known for so long. However, it can also breed a sense of relief and levity that engenders growth and new development. As you walk through your home, notice how you feel. Do you avoid going to certain areas because of clutter? Or do you smile in the natural lighting of a room? Is how you feel in line with how you WANT to feel? If not, get rid of the things that make you cringe to make space for things that make you happy. It’s really that easy. Repeat these steps with other aspects of your life, including food, relationships, and time. Doing this “life cleanse” will create opportunity for joy and happiness to enter. You’ll be amazed about what can happen! 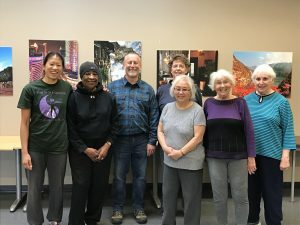 If you’d like more guidance on spring cleaning, I’ll be giving a Spring Clean Workshop at Marlene’s Market & Deli in Federal Way on Saturday, April 7 from 10am-12noon. See events page for more details.